It has been a little quiet here on 6645 since all our BUND talks, so I hope this will kick off 2011 in flying manner. I have a little mystery here. It is a little smaller than the 817 "Viggen", houses the 1872, and does not have the same caseback markings which usually features the full issue number. Here it is only "three crowns" and a "running" number of 280. I hope someone have an idea of the history of this watch. the watch isn't mine, but posted here with the permission of the owner. HAppy New Year to you not sure but could do with a shot of the back of the watch with the caseback fitted.....? Ooh! Very interesting. I'd like to hear more about this one. God only knows where these watches hide out, but I sensed that you something on the go, Lars. Well done. Ditto - very interesting - also, the 12hr Navigator style bezel seems unusual for a SwAF- or is this just me? However, it is the case that is the main issue here, I think. The lugs are totally different from most, if not all SwAFs I have seen, with a taper to much thinner ends and a graduated chamfer at the edges (and a curved front face), rather than constant width face on trapezoidal lugs on others I have seen. The same post above illustrates this quite well. I am sure Colin (Nalu) will be along in a moment or two to help clarify this better than I could hope to. But my conclusion would be that whilst it is a lovely watch, the SwAF origins are dubious, there are too many variations. I will hopefully receive a back photo with the case back fitted very soon. Thanks for your comments. I'm aware of the "steel bezel" thread as I started it (Lange=longbear), but as noted the bezel is not the topic here. It is not very clear from the pictures, but this watch also have another model number stamped inside the case back = 617, and is some what smaller. So this is not a standard SwAF 817 and does not pretend to be. Interesting observation about the recessed circle - very useful. That the number is only 6 away from the 817 DaveS mentions, would be insignificant if they are delivered under another/earlier contract. BTW The Lemania SwAF t195 did also only have the crowns. As with the "steel bezel" thread, maybe the right answer is a question: Does this Lemania exist in a civilian version? Just a couple of comments to add to this, as it seems that this is indeed a very rare and interesting piece. Coming to the conclusion that calls were the most likely explanation, and one backed by industry experience (from Watchgoddess). I personally have not seen another version of this watch, civil or issued. You say it is smaller than the more common (but still very rare) SwAF, would you mind sharing some dimensions? The hand length seems interesting too, as the minute hand doesn't extend to the minute ring. Neither would the chrono-second hand seem to reach (as it just touches in the shot above, which is viewed from below and there gives a flattering perspective). thanks for your interest in finding out more about this watch. I hope the additional info/pics can help us. I haven't seen another of these, so we can't even point to a possible donor watch if that was the case. Dial closeup - there is indeed markers at 5-10-15 etc - small but they are present (and more or less unusable if you ask me). I was also quite sure of that explanation, but suddenly I realized that the naval Breguets have markers at 3-6-9-12-15 where the normal version doesn't have markers. 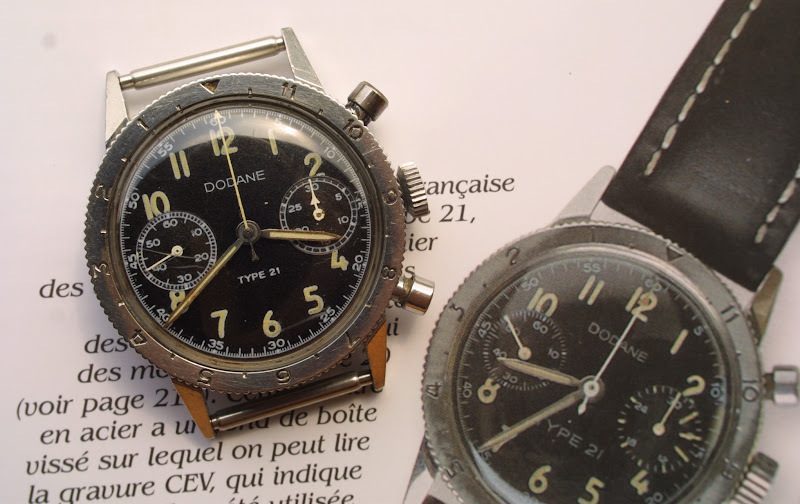 Further and even more interesting is the photo below with a very special Dodane T21 CEV, it is not the watch that is interesting but the magazine. 3 minute markers all way around the 30 minute counter PLUS the written sub-dial markers are at 6-12-18-...... !!! The fact that the sub-dial is marked like that, leads me to believe that 3 or 6 minute intervals had some special significance for pilots and maybe naval pilots in particular? PS also the Breitling co-pilot features markers at 3-6-9-12-15.
picture stolen from Laurent B on "coin des affaires"